Roberts' Big Oak Farm is a 4th generation family farm where we raise Black Angus beef cows. Our cows are raised as nature intended on our family's 200+ acre farm in Cabarrus County, North Carolina. We are located within a 1/2 hour drive north/east of Charlotte, NC or a 15 minute drive south/east of Concord, NC. We sell Black Angus beef on the hoof, by the carcass weight and by the package. You can pick out and pick up your Angus Beef at the farm or we can deliver to the processing facility of your choice. If you want only a ½ or ¼ cut of beef, find a neighbor willing to share or give us a call and maybe we can find someone with whom you can “Cow Pool”. We also now offer Black Angus beef by the package – call for availability. We also offer Local Honey and farm fresh brown eggs, when available. 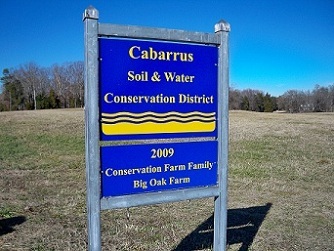 Roberts' Big Oak Farm was awarded the Cabarrus County Soil and Water District Conservation Farm Family of the year for 2009 due to our conservation practices.